Whether you have one day to explore the Icelandic countryside or one week, the Golden Circle is a classic route that’s a must-see for every Iceland visitor. One of the most popular tours in Iceland, sites on the Golden Circle are open to visitors year round, though by far the most popular time to visit is during the summer months when temperatures are warmer and the road conditions are easier to manage. 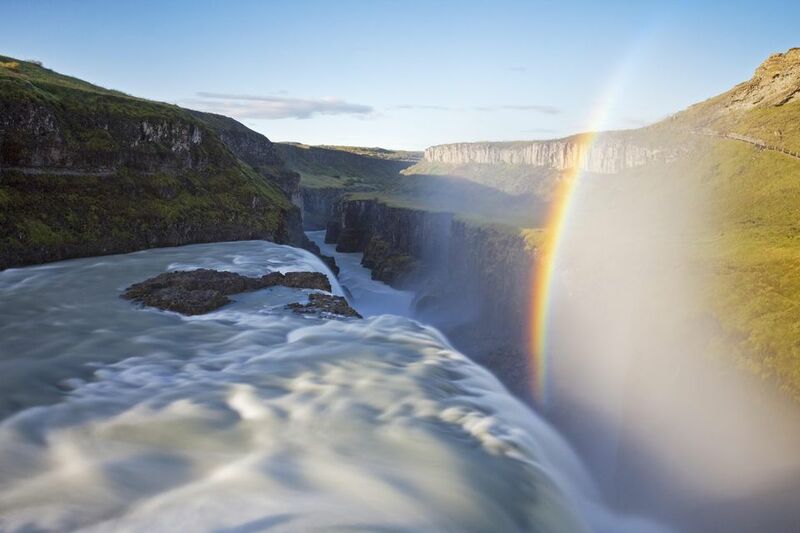 There are three main stops on the Golden Circle: Þingvellir National Park, Geysir geothermal field, and the Gullfoss waterfall, one of Iceland's most impressive. In addition to these main sites you can customize your trip with a dip in a traditional thermal spring bath, a collapsed volcanic crater, thermal river, and even a Game of Thrones filming location. Here’s everything you need to know about Iceland’s Golden Circle. With its first stop only 40 minutes east of Reykjavik, a visit to the Golden Circle makes the perfect day trip outside of the city. From bubbling geysers and warm hot springs to the crossing of two continents and powerful waterfalls, this popular tour is the perfect way to get a breath of everything Iceland has to offer. Because of the distance and amount of things to see on this trip, schedule at least 7-8 hours to allow for enough time at each destination. The first stop on the Golden Circle outside of Reykjavik is Þingvellir National Park. One of the main attractions to this beautiful park is that it sits between the North American and European tectonic plates, meaning you can (technically) stand between two continents at once. If you’re feeling adventurous you can even snorkel or SCUBA dive between the plates themselves and bear witness to some of the clearest water in the world. In addition to taking a dip in the clear waters, you can also hike up to the breathtaking Öxarárfoss waterfall for a view of where the main river plunges through the valley you walked through just minutes ago. Game of Thrones fans will be pleased to discover that just a few minutes to the right of the waterfall on Öxaárfoss Trail is the location of three scenes from season four: a Wildling camp where Ygritte and Tormund were filmed, and the famous Bloody Gate scene, the narrow path that Arya and the Hound take to visit her aunt. Cost & Hours: Full-day parking: 750 ISK (around USD $7). There are multiple parking lots throughout the park, so if you’re not up for hiking you can drive and park to see the main sites. Open 24 hours. Visit Length: 45 mins - 2 hours. The next official stop on the Golden Circle tour is the Geysir Geothermal Field. One of the most popular stops on the tour (and definitely the most crowded), this historic site is the home of the well known Geysir, plus many bubbling and steaming hot pools. Although the original geyser is no longer active, the new spectacle, Strokkur, is the main attraction here. Erupting about 50 feet in the air every 10 mins, tourists tend to flock and crowd around this site searching for the perfect photo. Depending on how many eruptions you want to see, this can easily be a quick 20 minute stop before you set off on your next destination. Cost & Hours: Free; Open 24 hours. Visit Length: You can spend anywhere between 20 mins to 1 hour at Geysir, depending on how many times you want to see the geyser set off and if you want to climb up the mountain to get a more aerial view of the geothermal area. Only 10 minutes away from Geysir is the enormous Gullfoss waterfall. There are two main viewing areas to see the falls and each has their own parking lot, so if you’re short on time it’s easy to see only one part (but we recommend seeing both!). The lower path of the falls leads to right up to the water; dress warmly or wear a raincoat here as you’ll be sprayed with constant mist and wind as the falls crash right in front of you. If you’re lucky enough to be visiting while the sun is shining, look out for rainbows as you descend for the perfect photo-op. Unfortunately this section is closed in the winter as ice can make the hike dangerous and slippery, so plan accordingly to your travel dates. The second viewpoint is always opens and provides a much more expansive view of the falls and the narrow river it crashes into. On a clear day, look out for glaciers and more rainbows in the distance. Believed to have been formed about 6,500 years ago, this crater is what’s left of a volcanic cone that collapsed and filled with water. The crater is strikingly colorful, with green moss and red rocks contrasting with the bright blue water perfectly. Although it can be seen in a quick stop if you’re short on time on your way back to Reykjavik, a hike around the rim or down next to the lake is work the extra steps. Cost & Hours: Entrance Fee: 400 ISK (around USD $4) with parking included when staffed. Open 24 hours. Visit Length: 30 minutes. The area is small, so it doesn’t take long to walk the edge of the crater or hike down to the lake at the bottom. Although it is far from a secret, this relaxing thermal bath is a great way to break up your Golden Circle tour with a dip in the relaxing 100 degree waters. Only a 10-minute drive off of the main Golden Circle route, a dip in the waters of one of the oldest swimming pools in Iceland is a great reward after hours of driving. Cost & Hours: Entry: Adults 3000 ISK, Children Under 14 Free. Open daily from 10 a.m.-10 p.m. during the summer months and is open 11-8 p.m. October-May. If you’re feeling more adventurous and have time for a hike, the trip to this warm thermal river is perfect for you. Just over a two-mile hike one way, this path is beautifully set between steaming hillsides, but because the area is so geologically active, it’s important to stay on the designated path. Once you arrive there are a few changing cabins and a café if you need to grab a bite before taking a dip in the shallow and warm waters. There are two main ways to tour the Golden Circle; self-drive or guided tour. If you’re short on time or traveling alone, scheduling a half- or full-day tour with one of the many available tour companies operating out of Reykjavik will be your best option. Although your time at each site will be limited to the pre-scheduled route, you’ll be able to see the main sites without the major stresses of planning your day and will be driven back to the city in time for dinner. If you have more time to explore or are traveling in a small group, renting a car and driving the day-long tour yourself is another great and affordable option. There are two different routes you can take to get there from Reykjavik: a longer, more scenic route that takes Highway 1 and Highway 435 up and through a beautiful mountain range, and a shorter, more direct route through Highway 1 and Highway 36 if you’d rather head straight for the main sites. If you’re driving the circle yourself, it’s important to fill up your gas tank before you leave the Reykjavik area. Although there are gas stations along the Golden Circle, most lie past the National Park, a good two-hours into the trip. Don’t leave yourself stranded without food and an empty gas tank. If you’re planning to hike and get up close to the waterfalls, hiking boots and a hooded rain jacket are strongly recommended if you’re visiting in the summer months. If you’re traveling during the off-season months of fall and winter it’s important to have substantial boots and to bundle up for snow and slippery paths. Whatever month you’re planning to visit Iceland, it’s important to be prepared for the unexpected; because the weather in Iceland is always changing, be prepared with multiple layers that you can take off and adjust as the day gets warmer. There are multiple food options at the gas stations in between the national park and Geysir and between Gulfoss and Kerið. There you’ll find famous Icelandic hot dogs, french fries, and even ice cream, each for the bargain price of $5 or less. If you’re traveling on a budget, stopping at a gas station for food is a great way to stock up on the necessities and treat yourself while avoiding the pricer cafes you’ll find at each of the main stops. If you’re traveling with a tour you’re unlikely to stop at a gas station, so be prepared to stop at a grocery store of cafe before your tour so you can pack your own snacks or sandwiches. If you forget or don’t have time to prepare before, there are cafes with lunch options at each of the Circle’s main stops with different price points.